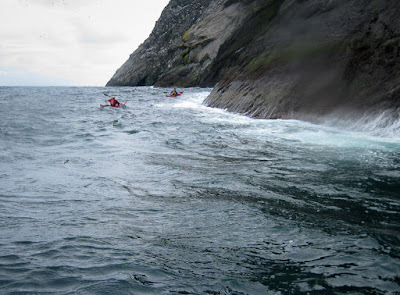 Sea kayaking the north end of Boreray and the Stacs. 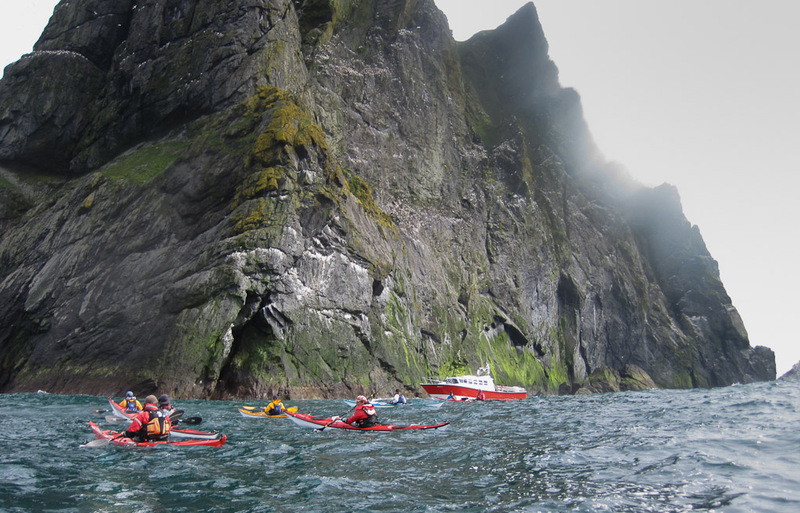 We emerged from the cave on the west coast of Boreray. 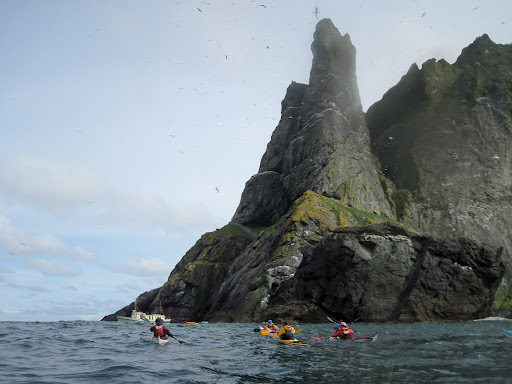 A freshening SW wind blew us north towards Stac an Armin. 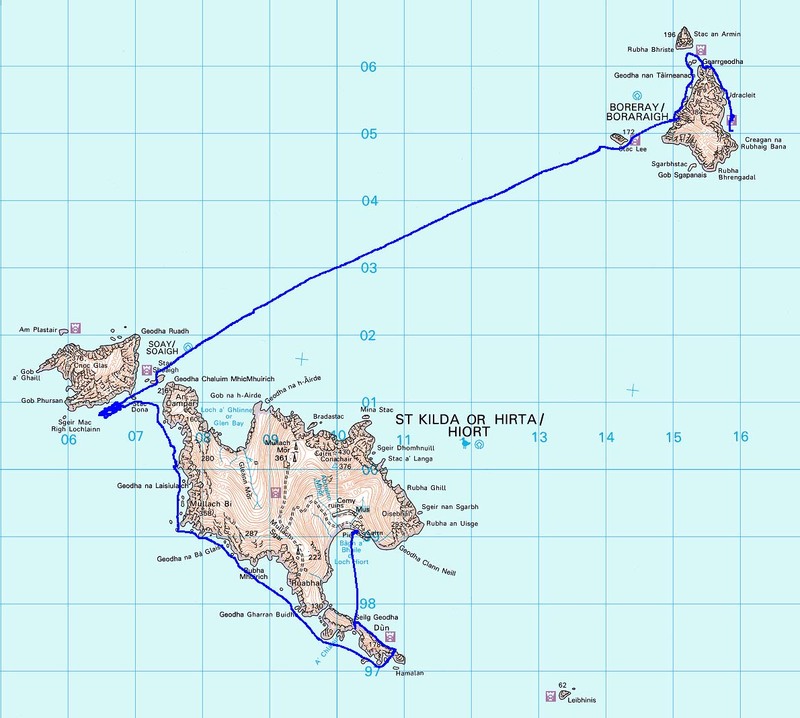 Our planned route was to go between it and the two small stacs in the foreground then loop back to the north of Boreray and down its east side. Boreray rose sheer out of the sea and rose to dizzying heights in the great horns of rock which form the summit ridge. 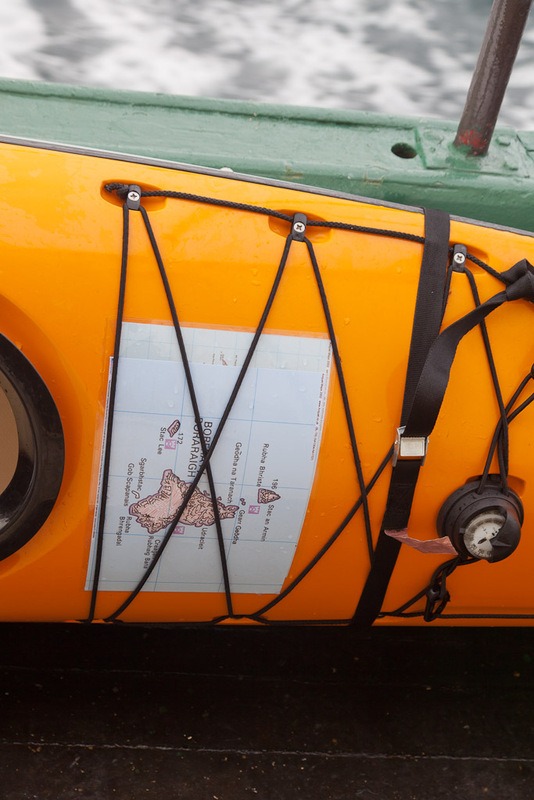 In Geodha na Tarnanach Gordon found a buoy circulating in the current. 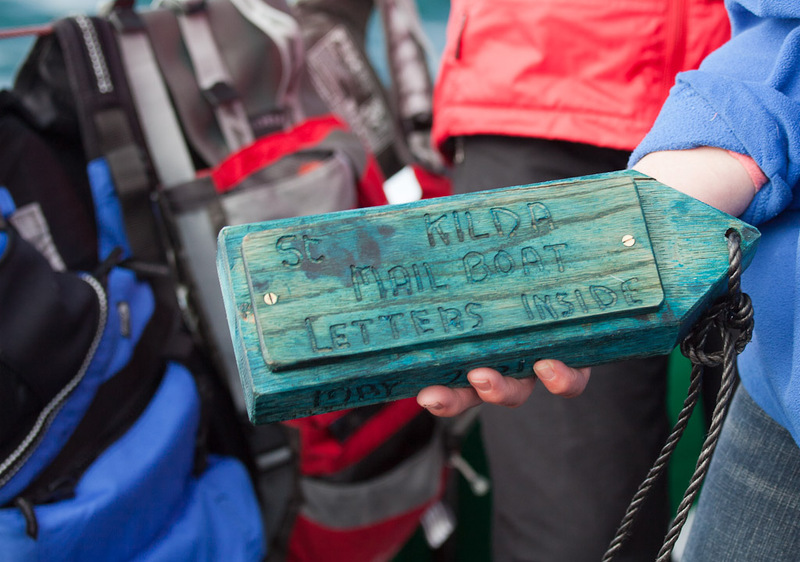 It was a St Kilda mail boat of the type used by the St Kildans in the winter when there were few visiting steamers. Some got washed up on the Hebrides, one even got washed up on Norway and the finder forwarded it to the addressee: the landlord, MacLeod of Dunvegan on Skye. In those days an inflated sheep's stomach replaced the fishing buoy. We later opened it and discovered it had been released by a member of one of the National Trust for Scotland work parties 6 weeks before. Simon phoned and asked what to do with it. The owner asked that it be released at sea again. From near Stac an Armin we looked SW to this amazing view of the archipelago. 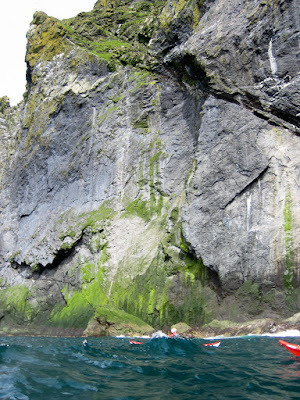 Boreray is on the left. 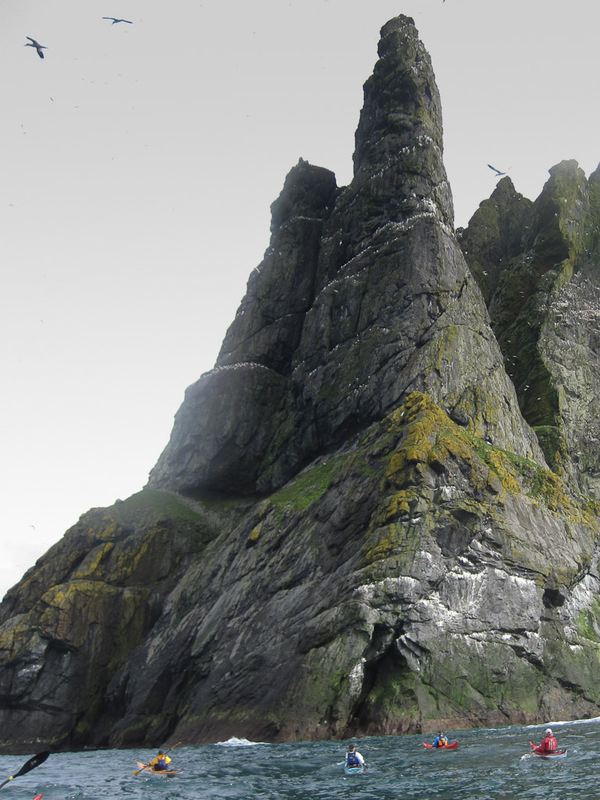 In the middle distance are a small unnamed stac and Stac an Armin. In the distance Dun, Hirta and Soay stretch across the horizon. 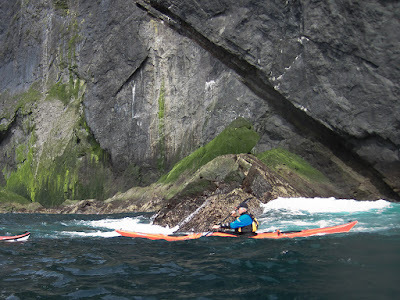 After we rounded the two small stacs we crossed back to Boreray just as the Orca 11 tour boat from Harris made her way through the narrow channel. We could just imagine skipper Angus telling telling his awe struck passengers about these dangerous, wild and uncharted waters when, all of a sudden, a bunch of sea kayakers bobbed up and down from behind a stack. 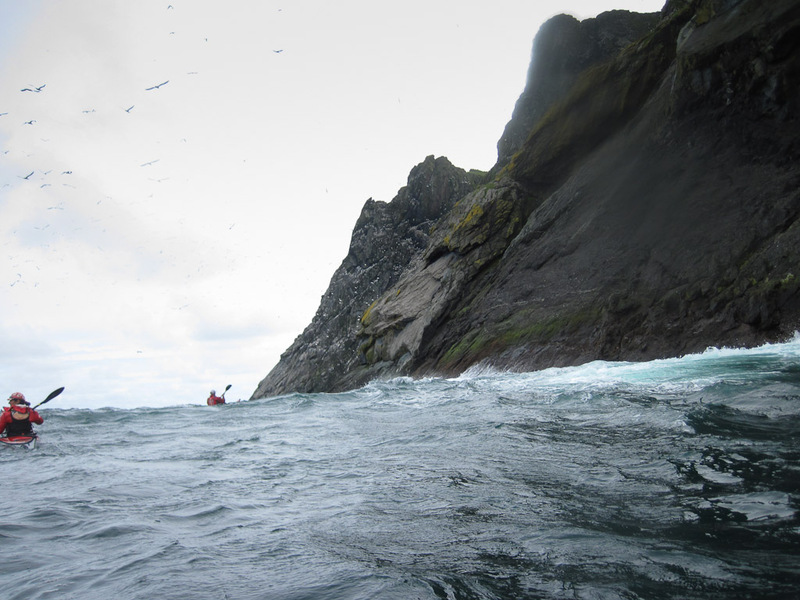 Words can't describe the north end of Boreray. ...the gusting wind was increasing all the time. It was rather difficult taking photos in these conditions but Ian has another great selection of photos which capture the bits I have missed out! Murdani knows these waters so well that he had picked the perfect spot for our rendezvous with the MV Cuma. It was sheltered from the wind, the swell and the tide and soon we were safely aboard. We had completed the most amazing crossing from Hirta to Boreray and the stacs. The skies had clouded over and the wind was continuing to increase. It was now time to scarper to the shelter of Scarp!